Here in the UK we’re theme park-crazy, with nearly 30 parks operating across the British Isles despite its rainy summers and long, cold winters. Major parks such as Alton Towers, Thorpe Park and Blackpool Pleasure Beach have been at the forefront of ride technology, installing a range of major attractions during the past two decades. Unsurprisingly, roller coasters have featured heavily in the theme parks’ plans. The UK is home to a bewildering array of coasters of all shapes, sizes and designs. For adrenaline junkies, it can be difficult to know where to start – so here’s a handy guide to the top 5 roller coasters the UK has to offer. Opened in 1991 at a cost of £5.2 million, The Ultimate was the longest roller coaster in the world at the time. While its 7,442-feet-long circuit has since been outdone by Steel Dragon 2000 at Japan’s Nagashima Spa Land, the ride retains the record for the longest time to traverse a coaster circuit at some 7 minutes 34 seconds. Snaking through 44 acres of woodland, The Ultimate features two lift hills in order to create the velocity needed to get around the lengthy circuit. While it has the appearance of a wooden coaster, it actual employs a tubular steel track. 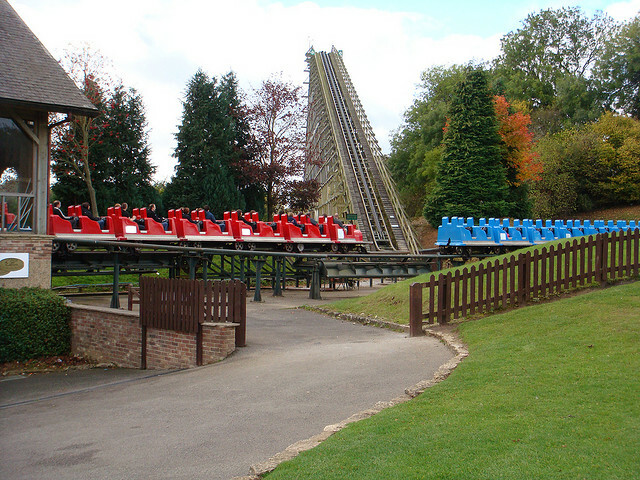 Featuring a top speed of 51 miles per hour, Lightwater Valley’s headline ride actually offers a relatively leisurely trip around some pleasant scenery. If you ride: Sit at the back to get the most exciting experience on The Ultimate’s two big drops. 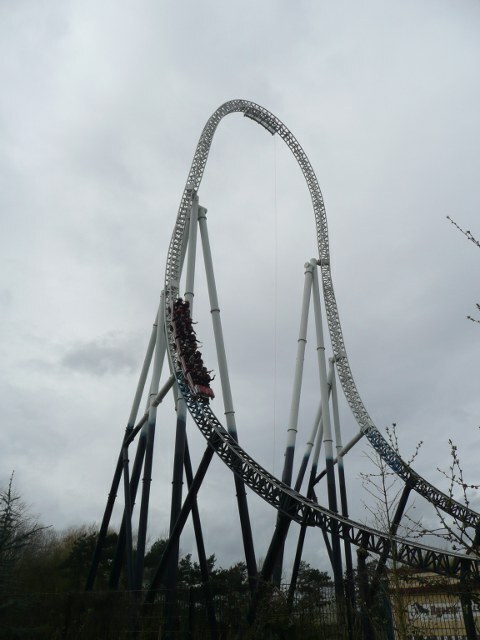 UK coaster fans had spent years gazing longingly at photos of the incredible launch coasters that manufacturer Intamin had installed at major US theme parks, before Thorpe Park opened its own version in 2006. Standing at some 205-feet-tall, Stealth’s circuit is very simple – consisting primarily of a launch area, the main tower, and a run-off section. The entire ride experience is based around the launch, which sees guests blasted from 0 to 80 miles per hour in just 1.9 seconds. 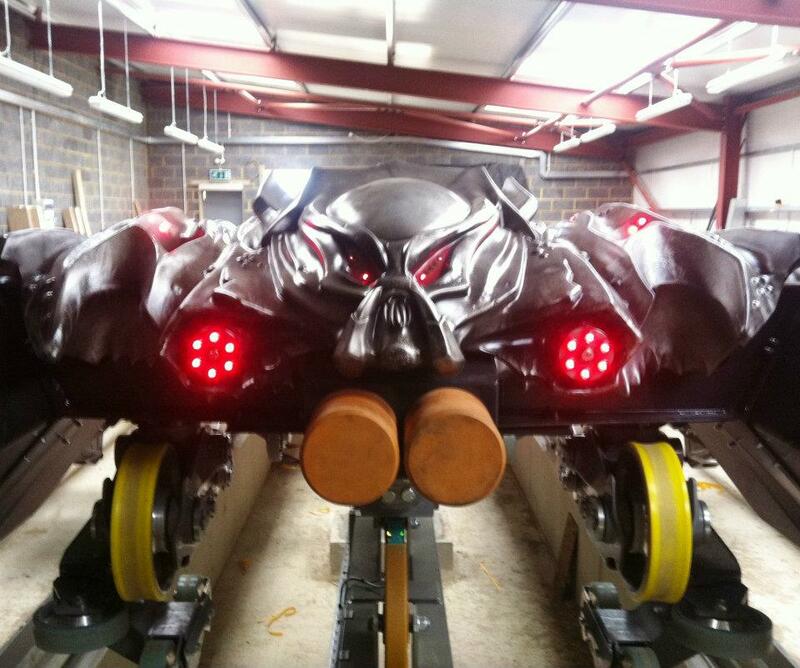 This makes it the fastest and tallest launch coaster in the UK, as well as one of the best of its kind in the world. If you ride: Be sure to keep your head back – the launch generates forces that will quite literally take your breath away. 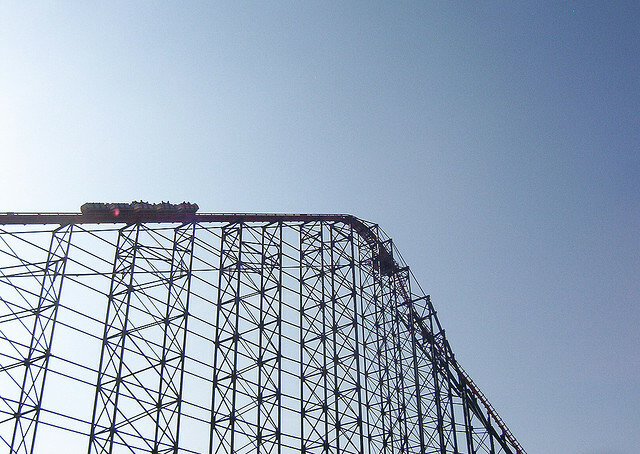 Opened with great fanfare in 1994, The Big One is the tallest roller coaster in the UK. It visually dominates Blackpool Pleasure Beach, although it fits surprisingly well with the long-running seaside amusement park’s collection of classic attractions. Arguably the best part of the Big One is its enormous lift hill, which carries riders to a height of 213 feet. It offers guests the chance to survey the rest of Blackpool Pleasure Beach, as well as the surrounding town and the coastline. You may struggle to concentrate on this, though, as you anticipate the intimidating drop that follows. After hitting a top speed of 74 miles per hour, you’ll then race through a series of twists and turns that make up the well-designed circuit. If you ride: Sitting towards the front will enable you to get a full impression of the height of the first drop before you plummet towards the ground below. 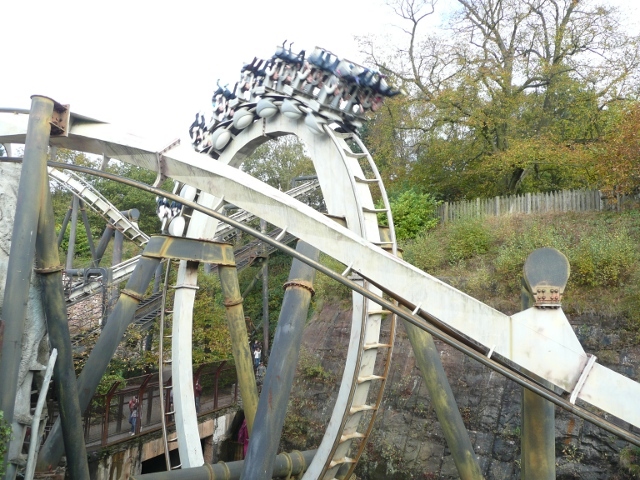 Now firmly established as the UK’s most popular theme park, Alton Towers put itself on the map with the 1994 debut of Nemesis. Europe’s first inverted roller coaster, the ride had to be constructed inside a deep trench in order to overcome strict height limits placed on the park by local authorities. Ironically, the location of the coaster is what has made it such as lasting favourite with UK coaster fans. Nemesis is short and compact, but provides riders with no time to relax – one amazing element follows another. Guests’ feet dangle below them, frequently coming very close to colliding with the surrounding walls of the trench – providing a sense of danger and exhilaration that the towering inverted coasters seen at other parks fail to recreate. If you ride: Make sure you queue at least once for the front seats on Nemesis, where you’ll get an unobstructed view of rocks and rivers of “blood” rushing beneath your feet. Opening in March 2012, The Swarm will become the first “wing rider” coaster in the UK. Guests will be seated on either side of the track, enabling them to experience close encounters with scenery elements as they race past them. Thorpe Park has pulled out all the stops to ensure that The Swarm will become one of the best-themed, most thrilling theme park attractions in the UK. The trains themselves will represent an invading “swarm” of aliens, with the ride racing through a post-apocalyptic landscape. Dotted around this will be a “crashed” aeroplane and helicopter, a burnt-out fire engine and the remains of a gutted church (which will double as the ride’s station). If you ride: Sit on one of the outside seats in order to get the best “near-miss” sensation. With the UK’s theme parks investing heavily to keep guests coming through their gates, expect to see a number of major new coasters open during the next few years. 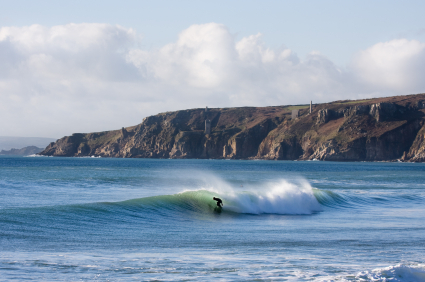 The country is rapidly developing into a thrill-seeker’s paradise, and you’ll find plenty on offer to keep your pulse racing for years to come.